Learn how to become a successful, effective consultant, freelancer, or entrepreneur. Based on the Best Seller “Leave the Grind Behind,” this article dives into exactly how to unshackle yourself from the 9-5 and join the You Economy. Put your talents, passions, and desires at the forefront. And make much more money while you’re at it. This is a massive freaking article. But this is a big topic. 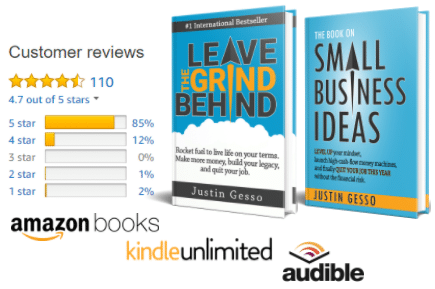 And if this article doesn’t quite give you enough, grab a copy of my Best Seller Leave the Grind Behind from Amazon. 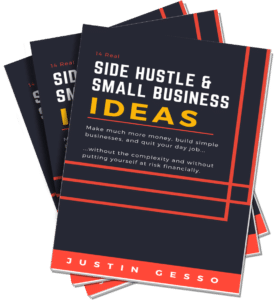 At nearly 400 pages, it dives deep into everything you see here, giving you the blueprint and motivation to make your own money and direct your own life. If you want the most from life, you owe it to yourself to dive on it. In the book, I argue that the best approach to leaving the typical 9-5 life is to establish a smart transition plan. There is a lot you can learn and leverage while you work for someone else, which will set you up for easier success. Along the way, you’ll work to have the right mindset, build the proper people network, and learn the right way to take effective action. This transition doesn’t need to take long. In fact, you can likely be on your own within a year. Are you just a Cog? Most of us grow up learning from our parents, society, and teachers that we need to go to school, get a job at a good company with nice health and 401k plans, then work really hard until we retire. That’s the recipe. And it will assure us security, a house in suburbia with a white picket fence, and a happy life. But is that really the best approach to life? We are at a fascinating point in history where many young people are beginning to question this formula. And unlike any time before, the technology is here that allows every one of us to cheaply connect across the globe–offering our services and capabilities in a way that has never before been possible. A brilliant software engineer from halfway across the world can put his skills up for sale to me by listing across numerous freelance and consulting websites. Working from home is just as effective as working in a high-tech office. And patching together the technology and infrastructure to operate individually globally is cheap and simple! In other words…there are no longer barriers…just excuses. This is no longer a game for just the highly technical or rich. This is anyone’s game. Do you want to burn your imprint on the world and create your own legacy? Do you want to live a superior life directed by you rather than someone else? Do you want freedom and the best things life has to offer? One of the biggest problems with working for someone else is that you are a Cog working to achieve their goal. This is true whether you work in a small business or at a big corporation. Of course you can set and maintain personal goals, but if you spend 8+ hours every day working for someone else, you have little ability to truly define your life and define your goals. You are spending the majority of your talents, skills, and energy building someone else’s legacy. Your creative solutions become the property of someone else. Alright, this all sounds great, but the reality is most people mess up. And many people end up working harder, for less money, and for more bosses. Don’t make the mistakes that get you there. Did you know consultants generally make twice as much as their employee counterparts? If you make $40 per hour as a bookkeeper, you can probably charge $80 per hour as a consultant. Why is this? Hiring employees is risky for companies. What if the employee doesn’t work out? What if there isn’t enough work? Not to mention benefits and other human resources overhead. With a consultant, it’s easy to cut ties and companies can pay for just what they need, no more. Also, consultancies tend to be more strategic in nature. Companies are able to bring in experts to help them get over obstacles or push to the next level. Because these engagements tend to be temporary, consultants can demand higher pay to compensate for their strategic value and also to offset the risk associated with the instability of the position. The only real problem is it’s easy to get consulting wrong. It’s easy to mistakenly stay a Cog. First, don’t charge just an hourly rate. While you can charge a solid fee, you’re not really achieving your goal of making it big and leveraging yourself. And if you’re just starting out, you probably don’t have the muscle to demand high fees. Make your engagement low risk for the company, but give yourself upside. Second, don’t do it all yourself. Start handing off work. If there is any routine or repetition in the work you do, have someone else do it for you. If you can charge $150 per hour and have someone do some of that work for $15 an hour, you may be cracking the code for creating a money machine. Third, don’t advertise your services. Stick to your network and extended network. People need a degree of trust in your services as you start. If you’re spending your time selling to a cold audience, you’re going to get distracted and waste a lot of time and money. You’ll be burning time rather than billing time. You have documented success metrics. You have clients willing to vouch for you. You are able to hand work off to assistants. It’s scalable. If you have a true money machine, then start breaking my rules here and get on with developing your business with full focus. Having the right mindset for success makes up the critical foundation of achieving exceptional results. You must have mental clarity and focus. You need motivation. You need enthusiasm. You need all cylinders firing. Many people I have talked to throughout my journey tell me they want to leave the grind behind. They envy those who have. They are not short on smarts. They do very well for their companies. So what’s stopping them? The answer is mindset. They misunderstand the risks. They see quitting a fantasy—not something regular people do. And they don’t really understand how money works. Your attitude. Positive attitude is key. You must overcome naysayers and failure. Over and over. But if you can, you will find yourself in a place most people won’t go. You become the exception. Life purpose. You need to determine your legacy and then begin working to achieve it. Big vision for big results. Just like companies have vision statements, you need one too. Goals. This goes without saying, but you need to break your life purpose down into aligned, actionable goals and begin knocking them out. Advertise success to yourself. We all know McDonalds, Coca-Cola, and Toyota. Yet they continue to advertise constantly. Why? This bombardment conditions your mind to take action (in this case buy from them). Why don’t you use this power selfishly? Constantly advertise success to yourself via effective affirmations. Visualize. Seeing yourself achieving goals has tremendous power that goes hand in hand with affirmations and goals. This engages your mind and senses in a way that gets you much more creatively thinking about how you will get the life you want. Subconscious. Your subconscious is highly effective at solving complex problems for you. You just need to be able to use it properly. If something has you blocked or stopped…consider asking your subconscious to solve it for you right before you go to bed. See what happens in the morning. Many of our best thoughts come while we’re in the shower rather than when we’re actively thinking about a problem. This is the result of subconscious delegation. So don’t let complex problems prevent you from making big changes in your life. Learn how to use your subconscious to get you through roadblocks and over hurdles. It’s not what you know; it’s who you know. We’ve all heard this saying, and if you want to leave the grind behind, you’ll need to live and breathe it. Even though this concept applies to the Cog world, it applies doubly so to the world where you’re in charge. Humans progress because we learn and advance from those that came before. We know this and don’t re-invent the wheel. You have the ability to level-jump results, avoid pitfalls, and leverage others’ connections. A Mastermind Group. Find a group of 2-3 people that are similarly focused on success and supportive of your becoming a consultant, freelancer, or entrepreneur. Meet with them weekly to discuss goals, progress, and hold one another accountable toward achieving greatness. Bounce ideas around and achieve greater individual success together. A Mentor. If there was a milestone in my career, there was a mentor behind it. Mentors have been down the path you’re headed. They can give you directions. They can warn you of dangers. They can direct you to the shortcuts. Once you have the right mindset and a good network in place, you’ll need to actually convert your energy into tangible action. You need to spend your time effectively and figure out how to convert ideas into reality. You also dive into effectively managing your two best resources: money and time. Maximize your current job. Take your job or current situation for a ride in order to prep yourself for going out on your own. Use it as a learning and experimentation platform. If you ever feel comfortable at your job, take that as a sign that you’re not growing and improving. Constantly seek promotions or to move laterally. Volunteer for complex jobs. Use your company’s educational benefits. Establish your own goals and take initiative. Free up time and money. Eliminate waste from your life so that you can have time and money available to you to transition from where you are now to where you want to be. Track what you spend your time and money on. Look for opportunities to go lean. If you can carve out just 1 hour per day to work on your goals, that’s 30 hours per month! If you can cut out your daily coffee purchase habit, you’ll have more than enough to pay for web hosting and an email marketing platform. It adds up fast. Take real action. Take your goals and chunk them down to individual tasks. Complete several tasks every single day. Before you start your day, write these tasks on a to-do list. If you make progress every day, you will achieve your goals faster than you expect. Learn marketing, sales, and execution. Pick up skills in these areas to ensure you can best take your value to market. Ideally you can learn these skills at your current job. Learn how to think about money. Most of us don’t really learn about money in school or during our upbringing. Start finding people in your network who are open to talking about their money, how they make it, and what strategies are. Dive into scalability, having numerous cash streams, net worth, and wealth. Figure out how to multiple your money, not just get incremental raises. Set specific, visual goals for your money. Use a successful model, then innovate slightly. Don’t start your new life from scratch! Find someone who has successfully done what you want to do. Follow their model and only innovate on one or two points to make it yours. While you’re still in your Cog job, you can begin consulting on the side. This gives you experience and clients to leverage once you quit. Most people don’t think they have the expertise to be a consultant. But the reality is, if you’ve been doing something for a reasonable amount of time (say 2-3+ years), you should know plenty. Start by doing a skills inventory. What specific skills have you developed over time? Which of those do you like? Which are you an ace at? Get specific and try to make a list of at least 20 skills you have. Yeah, that’s right. Make a list. Once you have your list, think about which of those skills are not held or liked by many people. Then, see if any of those skills go for a high fee. Do some internet searching to get an idea of pricing. If you can find something you’re good at that normally costs a lot of money, you’ve found something you can use to break into making it big. For me, it was website design, online marketing, and telecom strategy. Most Grinders get their start by consulting. Consultants generally make twice as much as their employee counterparts. To get your first deals, leverage your network. Use your Mastermind Group and mentor. Make money for results. Reduce their risk and expense of hiring you. Once you get in with someone and start delivering results, it’s time to re-evaluate your terms. Don’t charge just an hourly rate. Outsource repetitive or template-based work to assistants and interns. This is how you can scale. Alright, let’s figure out the types of value you can provide by doing a skills inventory. What specific skills have you developed over time? Identify at least 20. Which of those skills do you enjoy? Which are you an ace at? Once you have your list, think about which of those skills are not held or liked by people. Then, see if any of those skills are generally provided for a high fee. Go back and get your Mastermind Group’s input. Talk to your mentor as well. Let them help you refine your ideas. See if they can introduce you to someone who might benefit from your services. And Get Reading for More! I give you much more (almost 376 pages worth to be precise) in my book Leave the Grind Behind. This book went on to be a best seller for 4 weeks and in multiple countries. It currently has a 5 star rating. I know you’ll love it!